On Monday morning, from Raymond James Stadium in Jacksonville Florida, Feld Entertainment held a press conference announcing format changes for the 2018 Monster Energy Supercross series. A complete press release and video about the changes is below but here are the key points. Revised Points System with points paid back to the 22nd place. Elimination of semi-final racing. More riders will come out of each heat race and finally the LCQ to set the field for the main event. Four, triple-crown events that will see a three main event format with each main event getting progressively longer. Olympic scoring will be in place to determine the overall event winner. Two East/West shootout races for the 250SX class. Amateur Supercross racing at four rounds in 2018 on a tamed down track following the professional event. To learn more about each of these changes please see the press release from Feld Entertainment below. ELLENTON, FL – October 23, 2017 – Feld Entertainment® announced today that tickets for the 2018 Monster Energy Supercross season will go on sale tomorrow, October 24. 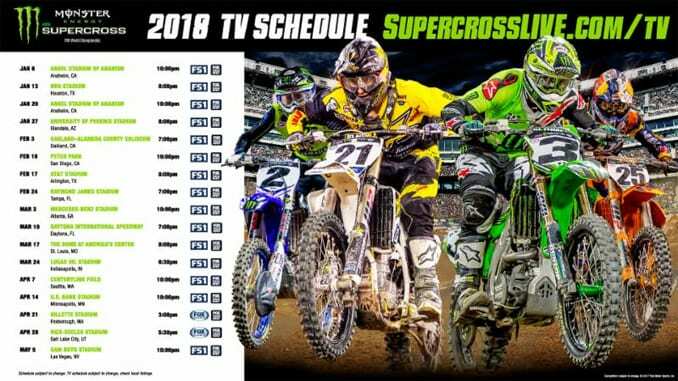 The 2018 season will be the most exciting and entertaining of all-time as a new era of Monster Energy AMA Supercross, a FIM World Championship, will change the battleground forever with a revised points system, the addition of three Triple Crown Monster Energy Cup-style events, two 250SX East/West Showdowns, four Supercross Amateur racing events and the elimination of semi races in qualifying for the Main Event. As the most competitive and highest-profile motorcycle racing championship in the world, Monster Energy Supercross has entertained millions of fans for 43 years. For the first time in over two decades, the 2018 season will debut an all-new points system to evenly allocate points overall 22 finishing positions. While the gap between 1st, 2nd and 3rd has not changed, the new points system will ensure that the race to the championship will be much more competitive throughout the season as the reward is greater for a better finish. The elimination of semi races will add further pressure to qualify as the world’s most elite endurance athletes will have just two chances to ensure a spot in the Main Event through one of two heat races or the last chance qualifier (LCQ). This year, the Top 9 in each heat will qualify directly into the Main Event while positions 10-20 will have one last chance to make it through the LCQ. Previously, only five positions would transfer to the Main Event from the heat races and all others would be transferred to a semi race. Eliminating the semi races will make for longer heat races and last chance qualifiers, allowing for more intense battles on the track from the stars for the fans.